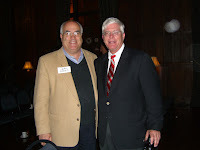 Hugh Hewitt met with we Denver Republicans at the University Club tonight in a very motivational talk. He told us he's made his mission keeping the topic of winning the war in Iraq the #1 issue in the 2008 Presidential campaign. This is his profile from his website: Hugh Hewitt is the host of a daily nationally-syndicated talk radio show heard in more than 100 cities across the county. He is a Professor of Law at Chapman University Law School, the Executive Editor of Townhall.com, and one of the country's most widely read bloggers at HughHewitt.com. Hewitt is the author of eight previous books, including the New York Times' bestseller "If Its Not Close, They Can't Cheat" and "Blog: Understanding The Information Reformation That Is Changing Your World," and the recipient of three Emmys during his decade as an anchor of a nightly news and public affairs show for the Los Angeles PBS affiliate, KCET. He served six years in the Reagan Administration in a variety of posts including in the White House Counsel's office. He is a graduate of Harvard College and the University of Michigan Law School and lives in Southern California. 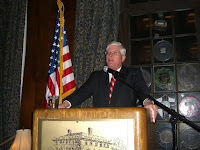 He can be reached at hugh@hughhewitt.com. Hewitt compared the current Presidential election campaign to the 1864 election, and he recommended that we all read his old professor Doris Kerns-Goodwin's Team of Rivals. which documents the history of Al-Qaeda from it's start (in Ft. Collins, Colorado!) to today. Denver could hold a GOP Presidential debate and all the candidates would show up, he suggested. It would be best if only those candidates raising at least 20% of the total funds raised by the front runner be allowed to participate. The publisher of Inc. Magazine has called it the most important book ever written about start-up. Bhide's has sent his students to take a look at how successful businesses actually got started. What he has found is that they don't spend resources trying to figure out the future. Looking back, we can see the dip in almost every startup. If we could plot it in advance, we would have a planned economy rather than a free-market economy. Seems to me the dip is descriptive, not prescriptive. And just as most boxers come from the gutter, most new enterprises start from pain. Whatever the reason, entrepreneurship has become a popular aspiration. A September 2005 Baylor University study reports that since 1980, more than 5 million jobs have disappeared from Fortune 500 companies, while 34 million new jobs were created at small businesses. Also, the number of small businesses increased from 14.7 million in 1977 to nearly 32 million last year, according to IRS tax returns. Today, one in 12 adults is actively involved in starting a business, and more than 60 percent of 18- to 29-year-olds say they aim to own their own business. Business BoomWhile equal opportunity was fueling an entrepreneurial boom, the world of small business was changing in other ways as well. Getting SchooledAs more entrepreneurs began launching new enterprises, colleges and universities sensed a hunger for information. The institutions soon created courses and whole new training centers to help this new generation of entrepreneurs learn business skills. From the first MBA entrepreneurship program launched at the University of Southern California in 1971, entrepreneurship education grew fast. By the early 1980s, more than 300 universities had courses in entrepreneurship and small business, the Baylor study found. Early entrepreneurship centers found an immediate and enthusiastic audience, says Rudy Lamone, founder of the Dingman Center for Entrepreneurship at the University of Maryland, which opened in 1986. "We were just overwhelmed with phone calls and requests to come speak and to help solve entrepreneurial problems," he recalls. Networking breakfasts and workshops initiated by Dingman in the Baltimore/Washington, D.C. corridor were mobbed, as hundreds of new and would-be business owners sought to learn from and do business with each other. Copyright © 2007 Entrepreneur.com, Inc.